Cellular Shades are a popular window covering with a large selection of colors and fabrics. These honeycomb blinds are the best product in the market for black-out shades and great for heat control in your room. These honeycomb blinds will provide lasting beauty and elegance all in one. They transform light to fill a room with a warm luminous glow. 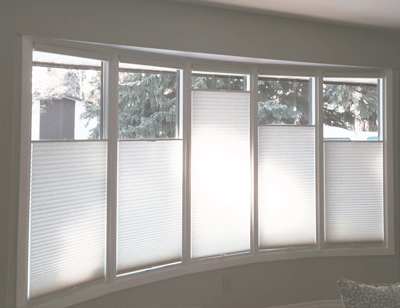 Cellular blinds are available in a number of sizes depending on the depth of your windows and your design preference. There are no visible cords or unsightly cord holes. Cellular Shades are white on the back for a uniform exterior and great for condos that require white on the exterior. As a result, you are still able to have color on the interior. Honeycomb blinds are made with scotch guarded, anti-static, dust repelling, mildew resistant fabrics and their pleats retain their shape permanently. Cellular shades are available in sheer fabrics, light filtering and room darkening fabrics. Blackout Cellular shades are the best room darkening blinds on the market. The inside of the cells are lined with foil which gives an insulation against the heat and cold. Cellular shades are available with the cordless feature and are great for kids rooms…no strings to worry about! Cafe style blinds give privacy while still allowing light to flow into the room. Additionally, cellular shades can be made in a vertical application so you can have a consistent look throughout your entire house. The cellular vertical application combines the soft glow of semi-opaque fabric with the convenient movement of vertical blinds. It’s a stylish and flexible way to illuminate your space. They fit vertically in rectangular windows and door openings, and with the 3/4″ single cell size, you can create a totally coordinated look with other cellular shades in your home. One of the best solutions for a patio door. Learn more about Moodscapes Cellular Shades.